Scared Evil Records has sought out a myriad spectrum of multitalented, enthusiastic and dedicated musicians under it’s banner. This international team of psytrance talent is unified by one thing, to put the music first and to deliver stellar performances illustrating constantly renewing sounds of the surreal. Since back in 2008 Scared Evil Records has released a whole lot of commercial and also free downloadable darkpsy music under a creative commons license. 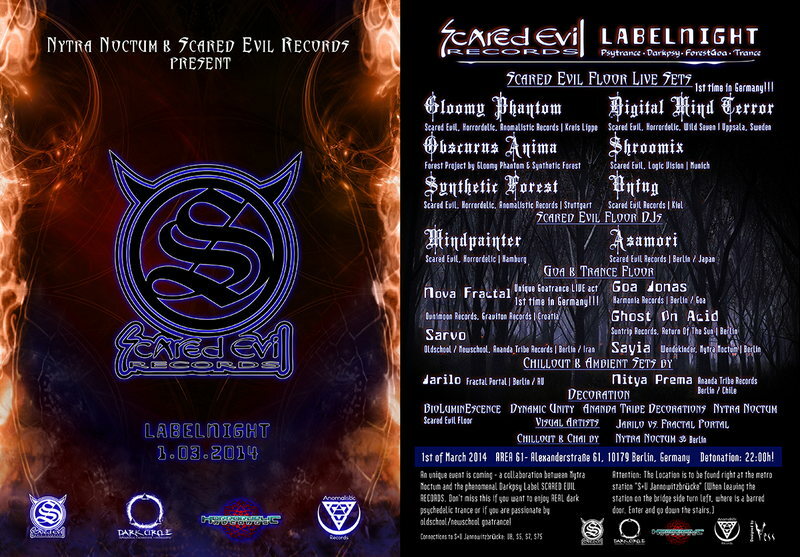 After a short break from late summer 2011 til spring 2013 Scared Evil Records has sorted it’s mind and is now back with much more strength and power to deliver again some well sorted darkish sounds. All Scared Evil artists are playing under the Banner of the Dark Circle! From the depth of the psychedelic underworld comes the Dark Circle. An association from Scared Evil Records, Horrordelic and Anomalistic Records. The aim is to further strenghten the darkpsy scene and be a constant force of happenings in the scene. As we move forward into the future, we make sure to keep you on the edge of your seat, edge of brainactivity. Always bringing you the best of the underground darkpsy, worldwide !! A unique event is incoming - in collaboration with the phenomenal Scared Evil Records darkpsylabel.